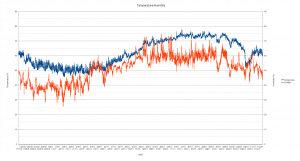 I had almost forgotten about the experiment I started late last year using the data logger I built to log the temperature and humidity values in my basement lab for an entire year. 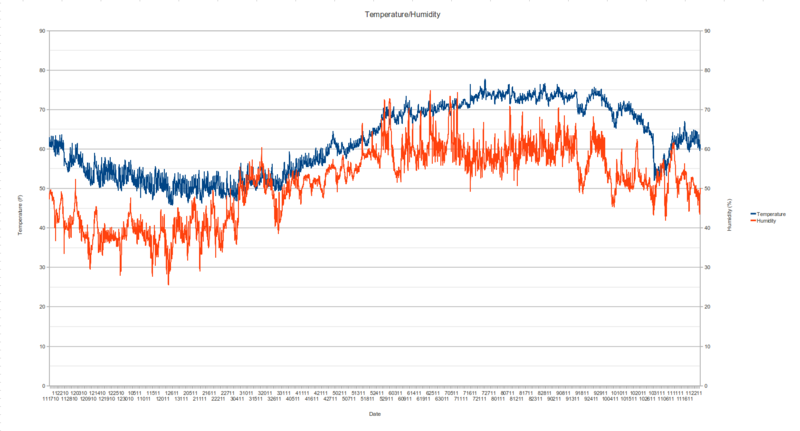 The logger worked well during the initial trial run, but having it run continuously for a whole year is another story. Anticipating possible power glitches and prolonged power outages, I equipped the data logger with rechargeable batteries and a trickle charger, which could provide many days of run time should the power go off. This turned out to be quite useful when the storm hit last month and left me without power for a week. As for the dip in temperature towards the end? Well, you’ve guessed it, that was due to the power outage during the Halloween time when the storm hit.